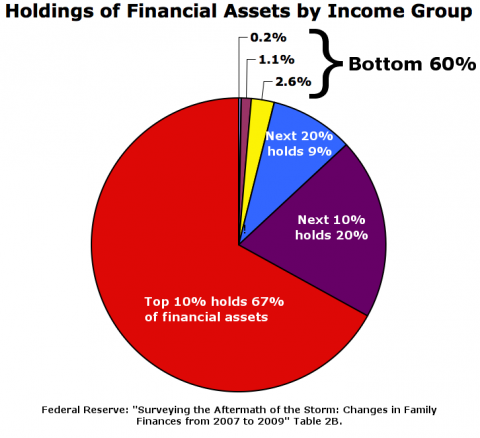 One percent of financial assets. Personal and corporate. Annually. With somewhere north of $55 trillion in U.S. financial assets out there (2009, down from $63 trillion in 2007), a Financial Assets Tax would generate more than $550 billion in annual revenue. Simple: greater prosperity and greater equality. Both. This idea seems to have far greater upsides than downsides. But I’ve undoubtedly missed some things, which I hope my gentle readers will fill in. But when they start objecting to the tax because it “will hurt poor people,” raise at least one eyebrow. First — as usual — they’re confusing flows with stocks. Savings is a flow. Money from savings goes into the stock of financial assets — cash in mattresses, bank account balances, CDs, stocks, bonds, collateralized debt obligations, etc. But that misconception aside, talk about being wrong by 180 degrees. This proposal does indeed discourage saving — in favor of real investment. If, on the other hand, people and companies use that money to build houses, apartment buildings, malls, office buildings, amusement parks, and factories, invest in new equipment and software, or spend it on those deucedly hard-to-measure but massive contributors to our national asset base — education, training, research, and development — the assets they create won’t be hit by this tax. And the ongoing income generated by those real assets will be taxed at a far lower rate. Alternatively, the income that isn’t saved might be spent on consumption — increasing monetary velocity and aggregate demand, and making the whole swirling pie that is the economy, bigger. If you think collateralized debt obligations are valuable national assets, you should hate this tax. If you think — correctly — that as Kuznets and many others have pointed out, real assets constitute true national wealth (though many of the most important real assets, like ideas, knowledge, skills, and “organizational capital,” are intangible and unmeasurable), you should love this tax. We might even want to include cash (actual dollar or euro bills). Why should we encourage cash in mattresses? TBD. My friend Steve tentatively suggested “anything that’s traded on an exchange,” which seems like a good idea except it would encourage Wall Streeters to move towards assets that are traded off-exchange, over the counter. We’ve seen the effects of that. What about incentives and economic distortions? How much would this tax distort economic decisions? Think: Nobody, ever, says “I’m not going to get wealthy because I’d have to pay taxes.” Why? Ask any of Jane Austen’s heroines: because there’s no substitute for wealth. Earned income? Quite otherwise, because there’s a very good substitute for working to earn money: leisure. Spending time with the kids, playing golf, writing overly long and abstruse economic blog posts, watching NASCAR, assembling intricate miniatures of Civil War battle scenes. In economic terms, the demand for employment is quite elastic because there’s an attractive substitute. The demand for wealth is quite inelastic, because there just ain’t no substitute for being rich. The Financial Assets Tax would provide a very slightly lower incentive to earn money every year (anyone care to do the arithmetic? ), but nothing like the disincentive that results (in theory, to some greater or lesser degree) from high marginal income tax rates, corporate profit and dividend taxes, etc. The biggest incentive — arguably an economic “distortion,” but every tax except maybe land value taxes is distortionary — would be to spend on real investment (and consumption) instead of saving. But that incentive would actually compensate for an inherent distortion resulting from the nature of financial assets, which are at root an artificial creation: Financial assets don’t decay and depreciate like real assets do. After ten years (or whatever), you still have the initial capital, plus the returns, which is not true with fixed investments. So fixed investments have a big disadvantage when they’re competing for “investment” dollars. A Financial Assets Tax would to some degree correct for that inherent market distortion/inefficiency. Too big to fail. I’ve pointed out that the financial economy — the trade in financial assets — is many time larger (40x, 50x?) than the real economy — trade in goods and services. And it’s arguably many times larger than is necessary to lubricate and intermediate the real economy. And innumerable wise voices have pointed out the negative externalities of this excessive size: systemic risk of financial-market meltdowns that trash the real economy, gross misallocation of financial and human resources, etc. There have been some salutary if rather timid proposals to address this via taxes on financial transactions — the flows — to compensate for those externalities and shrink the sector. But this proposal for taxing the stock of financial assets could be a superior alternative. I’ll leave it to others, for now, to analyze the pros and cons of those two alternatives. What about private residences? This is both a large segment of fixed investment, and kind of a special case — different from business investments because the value derived isn’t in the ability to produce more, saleable goods and services, but having a roof over your head. 1. Sell all your financial assets and spend the money to build the house. 2. Sell $50,000 of financial assets for the 10% down payment on a loan, and borrow the rest. Your taxes on the house asset are the same either way. But in scenario 2, under the Financial Asset Tax proposal you also pay tax every year on the $450,000 in financial assets you’re still holding. So it’s less attractive. It effectively increases the interest rate on your loan by 1%. The first scenario reduces the value of financial assets by reducing demand for them; the second increases it. As Dirk Bezemer has explained, borrowing-driven booms in financial asset values drain resources from the real economy, and so are associated with slower real-sector growth. The second scenario also effectively prints $450,000 in new money, causing more inflation pressure, which puts pressure on the Fed to raise interest rates, which discourages real-sector investment. What about volatility? The value of U.S. financial assets (nominal — not inflation-adjusted) fell by 13% from 2007 to 2009 (assets held by U.S. households, nonprofits, and nonfarm, nonfinancial businesses — Fed Flow of Funds TFAABSNNCB + TFAABSHNO). Under this proposal, that would result in a huge hole in the Federal budget. Personal income went up by 2% (nominal) over that period (NIPA Table 2.1). This tells you: the revenues from a Financial Assets Tax would be much more volatile than from income taxes, because asset values are far more volatile than incomes. But let’s step back: Every reasonable person (this excludes large portions of the Republican and Tea Parties) agrees that it’s smart for government to spend more in the bad times (causing a government deficit), and less in the good times (causing a surplus). It’s intuitively obvious (thanks to Keynes), we’ve seen it work (1939 passim), and all sorts of old and new economic theory, notably Modern Monetary Theory, supports it in spades. The problem, of course, is politicians. When bad times hit and government revenues are down, they panic like scared children. They don’t remember (or look forward to) the good times, like when the federal debt was plummeting during the Clinton boom/tax-increase/surplus years. So they do exactly the opposite of what common sense and prudent wisdom prescribe: they cut spending. The volatility of the Financial Asset Tax could contribute greatly to this panic-driven policymaking. My only reply: it is to be hoped that the economic efficiency of the Financial Assets Tax — the growth and prosperity it engenders, especially in the real sector of the economy — would over the long term overwhelm the negative effects of political mismanagement. Other suggestions to overcome this difficulty, much appreciated. What about evasion and offshoring? Stocks of financial assets are easier to track and harder to hide than flows of income. They have to be stored somewhere. Since they’re not ongoing flows, they can’t be laundered and hidden as easily through multiple international pipelines and entities. People will still use secret accounts in the Bahamas to hide their money (as long as we allow the Bahamas bankers to get away with it; the Swiss can’t anymore…). And yes, people and businesses will figure out new schemes to evade this tax. People will always figure out ways to commit fraud. A simple tax on an easier-to-track item will make it harder for them to do so. Since we’ll tax domestic entities’ financial assets no matter what country those assets happen to be stored in (just as we tax worldwide income now — at least of natural humans) — people and businesses will have less incentive to keep piling up their treasure in financial (and real) assets overseas. They can bring it home at no cost (they’re paying taxes on it in either place) hopefully investing it in real assets here. Why not a consumption tax or VAT instead? I don’t actually know much about these, so take this for what you will. Those taxes are good because they don’t penalize or kill incentives for work, innovation, and real earnings (personal earned income and real — nonfinancial — corporate profits). But both of them, as I understand the proposals and real-world examples I know of, tax investment spending at the same rate as consumption spending. So they’re not really just consumption taxes. They’re also investment taxes. That’s not good. I assume there are carve-outs to correct for that, but the more carve-outs you put in place for various and sundry reasons, the more messed up, gamed, and inefficient tax regimes become. The Financial Assets Tax makes things much more clear and simple. That’s one value of a flat tax. Also: to make consumption taxes reasonably progressive, the top marginal rates have to be high, maybe even greater than 100%. Imagine a million-dollar consumer paying two million dollars in taxes on that consumption. You think that’s gonna happen? How do you phase it in? This would be a big change in the rules of the game. It’s both fair and efficient to give people time to adapt. I would do it based on: 1. person versus company, 2. age, and 3. quantity of financial assets. For people: Give a few year’s warning, then in the first year, people 30 and under with more than $5 million in financial assets would be subject to the tax. (I am rather unconcerned with these people’s well-being, or with their ability to adapt to the new regime over the course of their lives.) Increase the age and reduce the cutoff — perhaps ending at around four to six times median income — over ten or fifteen years. 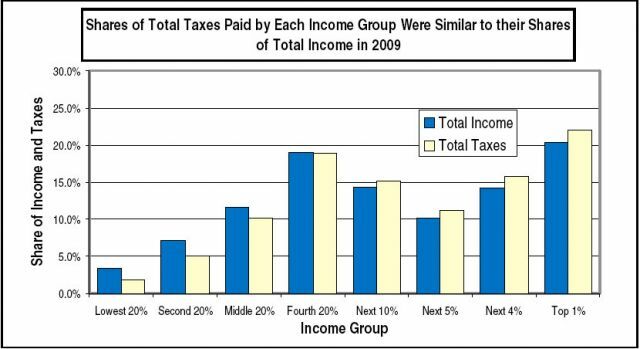 Other personal tax rates should decline in concert. For companies: Give two or three years warning, then replace the tax on C-corp profits with the Financial Assets Tax. They’ll adapt just fine — mainly by shifting from financial investment to real investment, but also probably by increasing dividends, putting the money back out there where it can be intelligently allocated by the wisdom of the crowds rather than by CEOs’ purported omniscience. Maybe this will also encourage corporations to hire CEOs who are real business managers, rather than practitioners of financial prestidigitation. Oh yeah: equity! Don’t change the channel, America. It matters. It especially matters to those who don’t have it. (Few of whom are reading this.) But excessive inequity hurts the rich too, in the long run, because it kills long-term national prosperity. Economically efficient policies that deliver greater equity also deliver greater long-term prosperity. Even the rich get richer under progressive policies (except maybe the very, very rich). The poor and the middle class get far richer. What do we mean by equity and inequity? Are we talking about income inequality? Feh. Source: Piketty, T. and Saez, E. 2007. Income and Wage Inequality in the United States 1913-2002. In Atkinson, A. B. and Piketty, T. Top Incomes Over the Twentieth Century: A Contrast Between Continental European and English-Speaking Countries, Oxford University Press, Chapter 5; series updated by the same authors. Hat tip Catherine Rampell. Source (pdf). The tax info here is just an added bonus feature, showing that above about $60K or 80K in income, our tax system (local, state, federal combined) isn’t progressive at all. The people making $160K pay the same share of their income pool as the people making $160 million. Sources (PDF): Sylvia A. Allegretto, Economic Policy Institute; Edward Wolff, unpublished 2010 analysis of the U.S. Federal Reserve Board, Survey of Consumer Finances and Federal Reserve Flow of Funds, prepared for the Economic Policy Institute. Another hat tip to Catherine Rampell. Figure 2. 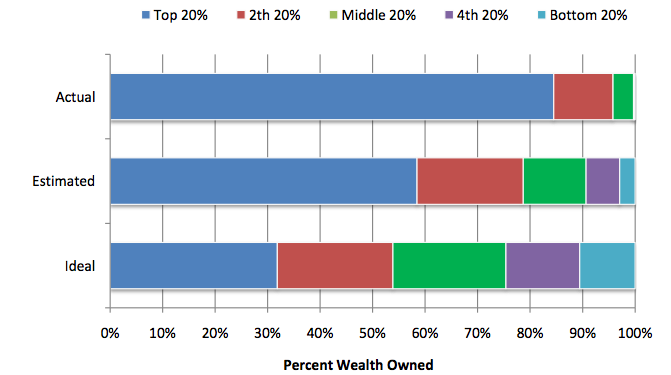 The actual United States wealth distribution plotted against the estimated and ideal distributions across all respondents. Ariely and Norton, 2010 (PDF). 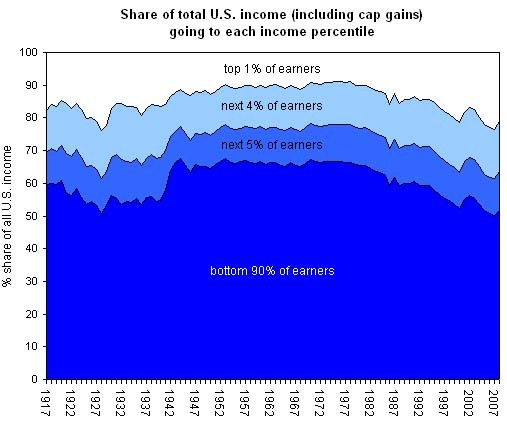 The bottom 80% gets about 40% of the income. 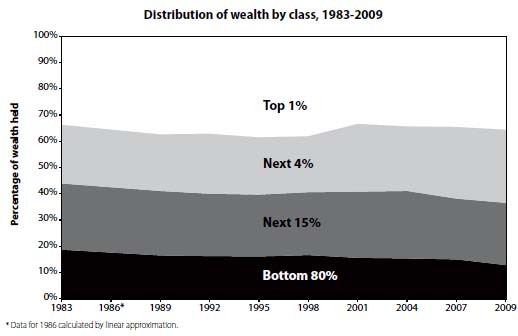 The bottom 80% owns about 15% of the wealth. You want freedom? Look to your bank balance. You want opportunity? Look to your bank balance. You want time and space enough to innovate and be an entrepreneur, without the disincentive (not to mention embarrassment and inconvenience) of potential financial catastrophe? You want to buy birthday presents for your kids, get their teeth fixed, or put them through good colleges, maybe take a family vacation every year or two? You know where to look. This would be a very progressive tax, because the the distribution of wealth is very regressive. It would compensate quite effectively for all our country’s regressive taxes, like payroll taxes, sales taxes, property taxes, and cut-rate taxes on financial investments. I don’t have the wherewithal to calculate the total resulting progressivity. Perhaps it would be excessive, to the point of economic inefficiency (though I doubt it). If we thought that was the case, we could reduce the rate from 1% to .75% or .5%, and continue income and other taxes at higher rates. Subject to discussion. Bottom line: If we want widespread freedom, opportunity, innovation, entrepreneurship, and healthy, happy living, all feeding on itself in a virtuous, self-perpetuating cycle, then broadly based wealth distribution is at least one necessary condition. A tax on financial assets would be an (economically) efficient and effective means to move towards that goal. Household leverage: what does the US have that the UK does not? So generally, this simple analysis would suggest that Menzie Chinn’s skepticism of a “status quo” of US consumer imports is worthy. But with the status quo firmly in place in Germany, the household saving data paint a foreboding picture – certainly for the Eurozone, but possibly for the global economy as well. The financial circumstances of US and UK households are very similar despite their diverging saving rates over the last two quarters (see saving rate chart here): leverage is high. The chart above illustrates the total stock of household loans/debt (including non-profit organizations, which is small relative to the “household”) as a share of personal disposable income. In the UK, household leverage peaked above that of the US at 161% of personal disposable income in Q1 2008, having fallen to 149% by Q1 2010. Furthermore, recent deleveraging by UK households has occurred through income gains, rather than paying down debt: spanning the period Q2 2009 to Q1 2010, the UK household stock of loans increased 1.2%, while disposable income grew 3.1% (you can download the data here). Given the remaining leverage on balance, the divergence in household saving rates across the US and UK is probably not sustainable. The UK household saving rate is likely to increase, or at the very minimum, hold steady. The problem is: that according to the sectoral balances approach, it’s impossible for the government and the private sector to increase saving simultaneously unless the UK is running epic current account surpluses (it’s not). Therefore, the £6.2billion in public “savings” may push UK households farther into the red. However, the more likely outcome is that UK public deficits rise amid shrinking aggregate demand (and with it, tax revenue) and the increasing household desire to save. The punchline: the US household has something that the UK household does not: (still) expansionary fiscal policy ($26 billion in state aid and extending unemployment benefits, for example). What is clear is that consumer goods do not vary that much; now, part of auto and auto parts is going to satisfy consumer demand as well, and here we do have some evidence in support of the hypothesis of the consumer going back to his/her old ways of sucking in imports. Consumption hardly seems resurgent, so attributing the increase in imports to consumers means that one is assuming a very high share of imports to incremental consumption — something I’m not sure makes sense. So, I think the book is still open on whether the consumer is going to drive the US back into a rapidly expanding trade deficit. Another way to look at this is by comparing global household saving rates. Specifically, I look at the household saving rates across the US (the world’s largest economy in 2007, as measured in PPP dollars – download the data at the IMF World Economic Outlook database), UK (6th largest economy), Canada, and Germany (5th largest economy). The household saving ratio is calculated as gross household saving divided by personal disposable income, as reported in country National Accounts. The German household saving rate is rising, while the UK households saving rate is falling. In the US, we’re seeing the household saving rate stabilizing above pre-crisis levels, even increasing at the margin. The table below lists average household savings rates for the pre- and post-crisis periods. Notably, the average US saving rate more than doubled to 4.8% since the previous 2005-2007 period, while that in the UK increased a much smaller 36% to 4.6%. Notably, German households increased average saving above an already elevated 10.6% average during the business cycle. I’m in no way “blaming” this on the Germans – the banking system there will eventually contend with the crappy Greek and Portuguese assets they hold on balance. But didn’t they learn their lesson? Relying on exports makes the economy highly susceptible to external demand shocks. More on the UK vs US in my next post. Note: Clearly, an analysis of this sort would require a much larger cross-section of household saving data. But differing measurement methodologies and data limitations make the comparison too arduous for a simple blog post. For example, Japan is not part of the analysis because only the expenditure approach to national income is available on a quarterly basis. Please explain this in the context of the “savings and investment boost” that was supposed to come from the 2001 and 2003 tax cuts. That means you, Bob McTeer. Bulldog to bulldog, as it were. One thing we heard in the comments to Coberly’s bravura Social Security op-ed was an opinion that the younger generation should be allowed to opt out of the program so that they can save their own way to retirement riches. This had me thinking, what’s the data saying about recent behavior — after all, factors including the declining prevalence of private defined-benefit pensions would increase households’ need for private savings. Ups and downs of the housing and stock markets being what they are, younger households in 2004 find themselves no more wealthy than their predecessors of nearly a generation ago, despite a a lot of risk transfer from institutions to individuals. This certainly doesn’t make much of a prima facie case for removing the retirement safety net. It’ll be very interesting to see the non-financial asset and debt data for ’07. [*] A quirk of the reporting is that the median asset holdings are reported for the subsets of households with assets. Given the prevalence of asset holdings for these aggregates, the asset and debt figures are roughly the 55-60th percentile figures.